My grandmother, a Pennslyvania Dutch farm girl, the oldest of eight children, was born in 1888. She and my grandfather continued to keep a small cottage in the country with a large garden, even though they lived in town. My earliest memory is in my grandfather's garden, and I have strong memories of my grandmother canning vegetables. She must have made lots of pickles, because I remember bread and butter, dill, and sour. Now, I realize how prolific cucumbers can be. Making those pickles might have been a chore for her, but a good memory for me. My favorite was sour; nowadays those are very hard to find in the grocery. Sometimes a large Kroger will have a few small jars; I buy them when I see them, but I usually compromise and eat dills. I keep these Mt. 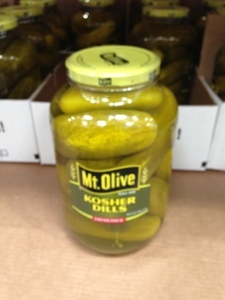 Olive Kosher Dills in the fridge. The jar at Costco is huge, 128 fluid ounces (a gallon) and the price at my Costco is under $4.00. The pickles are almost too large for one serving, better to split between two people. I've tried the small dills that Costco sells, but I don't like those as well. The Famous Dave's spicy pickle chips are great, slightly hot bread and butters.